Fewer refugees found a new home in Wisconsin in 2018 than any other year in a decade, despite the number of displaced people around the world reaching unprecedented levels. That’s according to data published by the U.S. State Department's Refugee Processing Center, which tracks refugee resettlement in the United States. 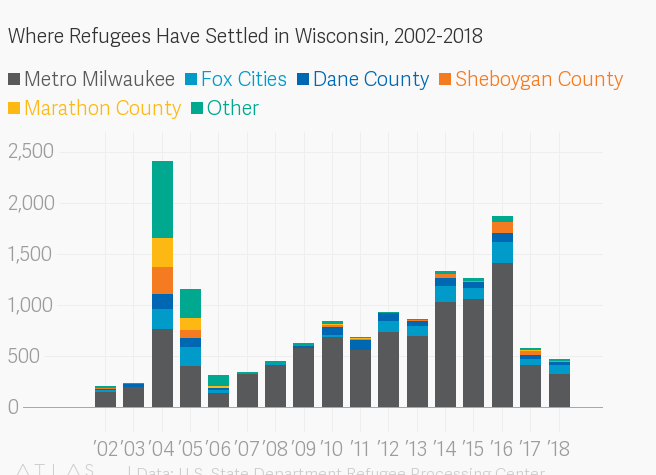 The 472 refugees who arrived in Wisconsin — down 19 percent from a total of 585 in 2017 — continued a steep decline in resettlements since 2016, when 1,877 refugees moved to the state. 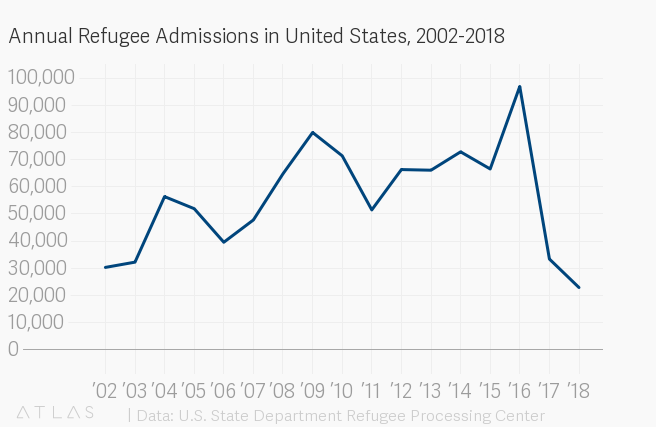 Refugees also arrived from fewer nations than in recent years, and only two countries — Burma (also called Myanmar) and the Democratic Republic of the Congo — accounted for the vast majority of new arrivals. 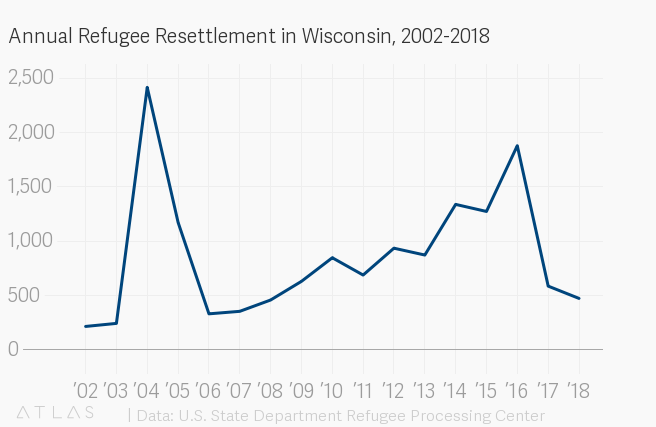 Wisconsin's pronounced drop in newly resettled refugees tracks closely with national numbers, which have fallen sharply during the first two years of the Trump administration. One of President Donald Trump's signature platforms has been to curtail immigration to the U.S., including through policies related to refugees. In 2018, the Trump administration capped the number of refugees that would be allowed to resettle in the U.S. to 45,000, the lowest such figure in 30 years. The actual number of resettled refugees nationwide in 2018 was even lower — by more than half. In 2018, 22,874 refugees from 62 nations were resettled in the U.S., marking a 76 percent decrease from 2016 and a 32 percent decrease from 2017. On top of that, the number of refugees arriving from several Muslim-majority nations effectively halted as a result of the Trump administration's travel ban policy, which was upheld by the U.S. Supreme Court in June 2018. Resettlement is a goal for millions of refugees around the world who must first navigate a painstaking bureaucratic process. That process begins with an assessment by the U.N. High Commissioner for Refugees, which decides whether a displaced individual needs to be resettled. Fewer than 1 percent of refugees around the world are recommended for resettlement and referred to a nation that accepts refugees. Refugees referred to the U.S. must take part in a lengthy vetting process coordinated by the State Department before finally being allowed entry. It's then that resettlement agencies, which receive federal funding for their services, take the reins and coordinate the arrival and placement of refugees. 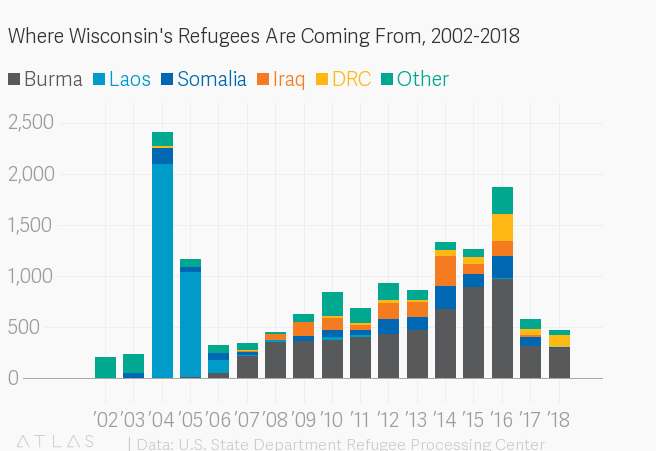 The refugees resettling in Wisconsin in 2018 hailed from 11 nations, with those from Burma and the Democratic Republic of the Congo making up 87 percent of arrivals. Much smaller numbers came from Pakistan, Somalia (which has travel ban exceptions), Afghanistan, Burundi, Eritrea, Rwanda, Ukraine, Honduras and Vietnam. 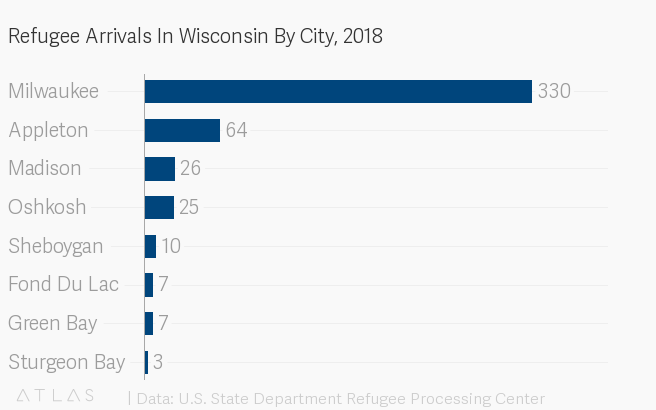 Continuing 21st century trends in Wisconsin, Milwaukee was the epicenter of refugee resettlement in 2018, with 330 refugees arriving in the city. That figure accounts for about 70 percent of the total number of refugees resettled in the state. But it wasn't enough to keep at least one longstanding resettlement program afloat, however, as Catholic Charities of Milwaukee ended its refugee program in July, citing the precipitous decline in arrivals. Several resettlement agencies remain active in the Milwaukee area, including Lutheran Social Services of Wisconsin and Upper Michigan. Mary Flynn is the program supervisor for refugee resettlement at the agency. She said the organization remains committed to resettling refugees in the Milwaukee area just as it has over the past 45 years, a period that has seen the influx of refugees ebb and flow. "We have the viewpoint and the perspective that this is probably going to be a temporary reduction," Flynn said, adding that she has been fielding calls in recent months from area employers concerned about the recently dwindling number of new refugees. "Employers are asking us, 'Where are the refugees?'" Flynn said. "They have positions that historically are entry level or low-paying, not the first choice of most U.S. employees. Refugees have always filled that gap. It's clear from the employers that they're feeling this pinch, and they're concerned about it as well." Refugees from Burma who are resettling in Milwaukee are largely from two ethnic minority communities in the southeast Asian nation. Many are members of the Karen people, some of whom have conducted a long-lasting insurgency against Burma's central government since 1949. Another group that is arriving in increasing numbers is the Rohingya, a predominantly Muslim minority that the Burmese military has in recent years forcibly and violently displaced, leading to an international refugee crisis and international condemnation. As of 2019, the growing Rohingya community in Milwaukee is thought to likely be the largest in the U.S.
Outside of Milwaukee, the Fox Cities remained the state's other major center of refugee resettlement in 2018, with 89 refugees making new homes in Appleton and Oshkosh. 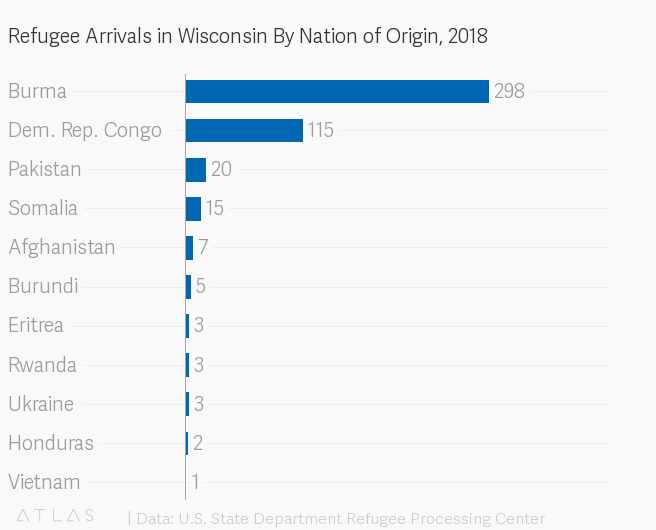 Many of the newly arrived refugees in this area are from the Democratic Republic of Congo, which made up the second largest share of refugees arriving in Wisconsin last year. Tami McLaughlin is the director of World Relief Fox Valley, which provides resettlement services in Appleton and Oshkosh. McLaughlin said that nearly all of the refugees her agency has resettled since 2017 have come from the Democratic Republic of the Congo, a large African nation that has been riven by multiple armed conflicts between various groups for years. The violence has led to a worsening refugee crisis, mostly along the nation's eastern and southern borders. Even as the crisis in Africa has continued, the total number of refugees World Relief Fox Valley resettled was down about 50 percent both in 2017 and 2018, McLaughlin said, though she expected an uptick in 2019 based on early numbers. "We started resettling the Congolese population back in 2014," McLaughlin said. "That population has really multiplied, and as of October 1, that's the only population we've been resettling." The exclusive focus on refugees from a single nation is not a World Relief policy, McLaughlin said, but rather partly a result of the federal government policies that have cut off the flow of refugees from nations with historical ties to the Fox Cities refugee communities. "Some of our other populations, especially the Arabic speakers, the Iraqis and Syrians, who are also waiting for families to arrive — those arrivals have greatly diminished," McLaughlin said. "We haven't seen any of those arrivals, actually, since 2017. That's been recently the most agonizing part of the resettlement process."